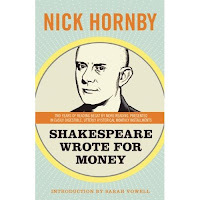 With an affectionate introduction by Sarah Vowell, this is the third and final collection of columns by celebrated novelist Nick Hornby from The Believer magazine. Hornby's monthly reading diary is unlike any arts column in any other publication; it discusses cultural artifacts the way they actually exist in people's lives. Hornby is a voracious and unapologetic reader, and his notes on books — highbrow and otherwise — are always accessible and hilarious. Earlier this year I read the first two books ( The Polysyllabic Spree and Housekeeping vs. the Dirt) from this collection and adored them. I sort of figured a new one would be coming out soon but am sad to hear that it will be the last! These are definitely great for bookaholics! He often times shares passages from several of the books he reads. It's great stuff! So I got this post together a few weeks early and between then and now a new cover was posted on amazon. How funny is that! The blue, orange, and yellow cover is the one that's currently on amazon. So that would lead me to believe that's the real one. Nice find - I will definately be on the lookout for these. Geez - how can I be a Hornby fan and not know about these?! I'm terrible. Thanks for posting - they're on my list now. There is always something new I find here! I will definitely look out for this and the other books u have mentioned! 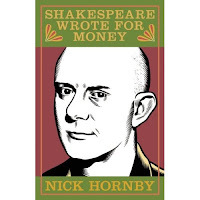 I love, love, love Nick Hornby. I'm waiting for the paperback version of Something Rotten by Alan M. Gratz. It comes out 1/8/09. OHHH I love Nick Hornby. Defnitely a favorite of mine, though I havent' gotten a chance to read any of these books yet. Must get the first two and then this one. Boo that it's the last though!! I've only read one book by Nick Hornby, *A Long Way Down*. It was great, and I'll look for this set of three books. I've been so out of it...I couldn't tell you to save my soul. Winter blues are coming...I can feel it. A.- I don't think they are really out there being advertised. I think i found out about them when I bought an issue of Believer magazine where these essays were originally published. I hope you like them! veens- Aww thanks! I love his essays! heather- My amazon wishlist is turning into a wishlist of paperbacks! Everything from this year is finally beginning to come out in paperback! shooting stars mag- Yeah I'm sad it's the last one. My only guess is that he stopped writing his columns for the magazine I don't know why else he would stop. I'm sad though! I am too excited for Beautiful Americans and College Girl! I need to read Wake too before i even think about Fade, it will happen I swear! dawn- I thought it was so funny that all of a sudden the cover changed. I do like the new one better too! j. kaye- Oh no, winter blues go away!